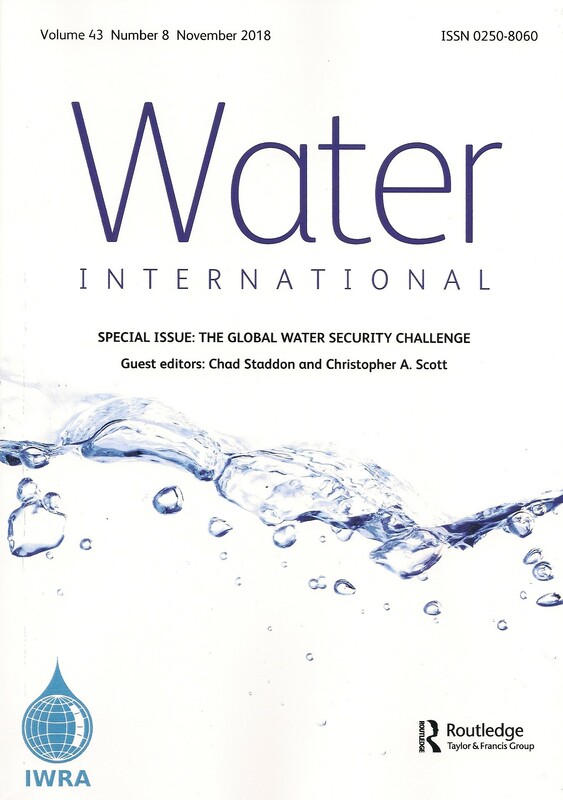 Professors Chad Staddon (UWE, Bristol) and Chris Scott (University of Arizona) have co-edited a special issue of the prominent journal Water International on the theme of “Putting water security to work: addressing global challenges”. This collection of papers, some of which were presented at conferences of the International Water Resources Association, is predicated on the notion that high level concepts like ‘water security’ need to be ‘put to work’, that is to say made operational and tractable in the campaign to improve water services for all. After an introductory paper by Staddon and Scott on the history and origins of the water security concept, five papers by leading researchers explore different aspects and applications of water security. The second paper, by Sarah Wade (formerly of University of East Anglia), considers how just and equitable many framings of water security seem to be, suggesting that equity needs to be central to any well-thought through water security framework. In particular she is critical of quantitative assessments of water security via metrics such as ‘average water per capita’ on the grounds that they do not acknowledge unequal distributions of water amongst competing groups. In the following paper, Dr Bimo Nkhata (Monash South Africa) argues that water security can best be approached by benefits-sharing approaches. Inspired by the work of Elinor Ostrom (Nobel Prize in Economics, 2009), this approach focuses not on water resources themselves, but on the benefits they may be associated with and, especially, the ways in which those benefits are distributed amongst competing beneficiaries. In their contribution, Scott, Albrecht, et al. suggest that the water security concept can be usefully aligned with John Rockstrom’s notion of planetary boundaries and resilience. In their view, water security can be operationalised in terms of the trade-offs and flows between water, food and energy (so-called ‘nexus’ perspectives) and mapped against regional or planetary boundaries to support these demands. This sophisticated approach allows for analyses to be rather more dynamic and systemic than others which focus on water alone. Albrecht, Varady, et. al. offer a very different perspective, focusing on the multiple security implications of the fact that water often flows over (or under) international regional boundaries. Though many resources have a transboundary character, water is the one of the few (air might be another) that complicates orderly governance by changing state (solid, liquid, vapour) as it moves across borders and boundaries. In the final paper, Staddon, Rogers et al. explore the implications for water security of differential uptake of the sorts of water storage systems that are common in many parts of the Global South. Focussing on rainwater harvesting systems, they argue that the key intermediaries in the relationship between potential beneficiaries and water storage systems are not income and education, but rather the existence of local organisations and programmes to promote and support adoption and maintenance. Global reception of this collection, released in December 2018, has been enthusiastic and follow-on publications are being planned.